Burma’s gem stone industry, one of the largest in the world, is now dominated by Nay Win Tun, who controls Burma’s largest gem trading business. The CEO of Ruby Dragon Jade & Gems Co Ltd is a young businessman in his early 40s. 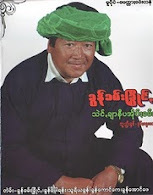 He is believed to be among the Top 10 richest persons in Burma. His company donated a massive slab of jade, weighing more than 3,000 tons, to the ruling junta in the early 2,000s. The high quality jade was more than 70-feet long by 20-feet high by 16-feet wide. Nay Win Tun is the right hand man of Aung Kham Hti, the leader of the Pa-O ethnic ceasefire group, and is also an executive of the Pa-O National Peace Group and Jade Dragon (Gems) Co Ltd, the parent company of Ruby Dragon Jade & Gems Co Ltd. He manages ruby and jade mines located in Pha Kant and Tawmaw in KachinState; Khamti in Sagaing Division; Mogok in Mandalay Division; and Mongshu in Shan State. The family members of high ranking Burmese army generals are believed to be shareholders of Ruby Dragon Jade & Gems Co Ltd, according to business sources. Nay Win Tun also owns businesses in neighboring countries such as Thailand, Singapore and China. He operates luxury hotels in several of Burma’s beach resorts and in Pha Kant, a popular town for jade trading in Kachin State. 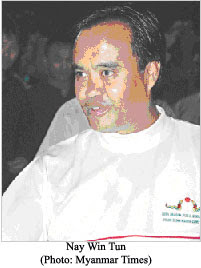 The New Light of Myanmar, the state-run newspaper, reported on March 9, 2007, that Lt-Gen Myint Swe of the Ministry of Defence attended the opening ceremony of the Royal Ruby Jade Hotel Resort and Spa in Rangoon, owned by Nay Win Tun. Nay Win Tun owns homes on fashionable Than Lwin Street (Windermere) and in Golden Valley in Rangoon. His business office is on Pyay Road in Rangoon. Rangoon is also the site of a large gem factory and a large commercial gem complex owned by Ruby Dragon & Gems Co Ltd.